from master pastry chef and “Sugar Rush” judge Adriano Zumbo! This beautiful cake by Adriano Zumbo depicts so many different layers that each represent a different scene of the Nutcracker and The Four Realms. It truly is a work of art. 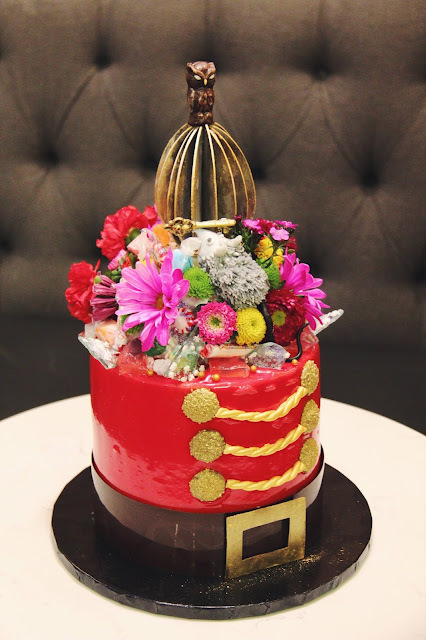 The Nutcracker and the Four Realms cake was created at Vanilla Bake Shop in Pasadena by “Sugar Rush” judge and master pastry chef Adriano Zumbo in celebration of the film's release on Blu-ray and digital (now available). This bespoke, multi-layer cake includes a Mother Ginger spicy and sweet cake, a chocolate forest cake inspired by the Fourth Realm, Sugar Plum Fairy candy jam and other hidden sweet treats within. The exterior of the cake features a Nutcracker red glaze adorned with edible figures, including Clara's chocolate puzzle egg with owl on top, a key and mouse hidden within a bouquet of flowers and candies.